Brian came to Seward Redesign in March, 2002 with more than 20 years experience in development. Brian led development planning for the Seward Longfellow Midtown Greenway Area and the Franklin LRT Station Area. During Brian’s tenure, Redesign has completed projects for redevelopment of the DoAll Building for occupancy by several East African owned businesses; the redevelopment of the Riverside Market site as a new home for Seward Coop Grocery including syndication of New Market Tax Credits; the redevelopment of the Franklin East Building, a neighborhood commercial center, and for acquisition of the Seward Commons site, a 3.5 acre phased redevelopment site near the Franklin LRT Station. As a past Executive Director of Neighborhood Development Alliance on St. Paul’s West Side, Brian undertook such projects as the redevelopment of the 116 unit Concord Square Apartment complex, Wabasha Center (a child care center and office development) and Wabasha Terrace (affordable townhomes). Brian is a licensed real estate broker and attorney. Renee began working with Redesign in 2011. Her work is focused on commercial leasing, new development projects and small business development. She also has expertise in and solar energy projects. Prior to joining the Redesign team, Renee was an independent consultant working in research and program evaluation with non-profits and neighborhood groups. Renee has a B.A. in Sociology and Master of Public Policy degree from the Humphrey Institute with a focus in Housing and Community Development. She is a licensed commercial real estate broker. Contact me for information about commercial property sales and leasing, and solar development. Shaina Brassard joined the Redesign staff in April of 2016. She manages the Great Streets Business District Support and Façade Improvement programs for Redesign, conducting outreach to area businesses and promoting commercial corridor revitalization in our service area. She also manages Redesign’s fundraising efforts. Shaina comes to Redesign after 4 years with the West Broadway Business and Area Coalition on Minneapolis’ Northside. At West Broadway, Shaina was the Marketing and Communications Manager and interim Executive Director. Shaina has a BA degree from Vassar College, spent several years living in La Paz, Bolivia and is fluent in Spanish. Contact me for information about façade and property improvement grants, business technical assistance, the Hiawatha Revolving Loan Fund, and business expansion in Greater Longfellow. Alan joined the Redesign team as Property Manager in March, 2015. Alan manages tenant leases, monitors day-to-day operations of properties and implements leasehold improvement projects. Prior to joining Redesign, Alan worked for more than fifteen years with tenants, owners, associations and brokers, managing, renovating, leasing and selling commercial and residential buildings throughout the metro area. Alan is a licensed real estate agent and a graduate of Metropolitan State University. Contact me for information about the management and leasing of Redesign properties. Scott Shaffer is the newest member of the Redesign staff, joining in March of 2017. 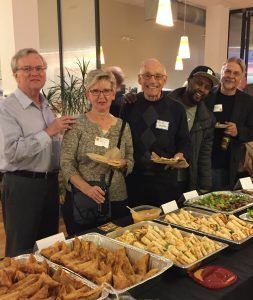 He manages the Reconnecting Neighborhoods project, where he works with community and government partners on a plan to re-establish and improve connections between Seward and the West Bank over Interstate 94, especially walking and biking. Scott has been engaged in bicycle and pedestrian planning and advocacy in Minneapolis for four years. He has a BA from Macalester College and a Master of Urban and Regional Planning degree from the Humphrey School of Public Affairs. He and his wife live in the neighborhood with their two Siamese cats. Contact me if you want to get involved in improving walking and biking connections between Seward and the West Bank. Neda joined Redesign in October of 2017. She works closely with the Executive Director to manage administrative tasks, fundraising, and systems of the organization to ensure efficient operation and enhance communication and productiveness. She has a strong background in administration as the legal case coordinator for various alternative dispute resolution service providers. Neda has a JD from Hamline University School of Law. Contact me for information about our website, and Redesign benefits and administration. Brigid joined Redesign staff in May of 2018. She provides design consulting for the Façade Improvement Grant program, and assists in fundraising and event planning. Brigid has previous experience working as an arts educator with Minneapolis Institute of Art, where she focused on engaging the community through their Mobile Mia and Art in the Park programs. She has also had experience working in arts administration at Intermedia Arts as a HECUA Art for Social Change intern. Brigid graduated from The University of Minnesota as a Community Engagement Scholar, with a double major in Art and Urban Studies. Contact me for information about Redesign’s 50th Anniversary Summit and the Façade Improvement Program. Redesign’s volunteer Board of Directors is a vital part of our success. All of our board members live or work in the Seward and Longfellow communities. They bring to the organization many years of experience in community development, affordable housing, public service, urban planning, finance and lending, education, design, construction, neighborhood organizing, small business ownership, transit oriented development, and nonprofit administration. Tal is a Manager of Single Family Community Development at Minnesota Housing, where he manages new construction, acquisition-rehab, owner-occupied rehab, and homebuyer education and counseling. Previous to his work at Minnesota Housing, Tal did non-profit housing work for agencies in the central cities of Milwaukee and Saint Paul. He has lived in Seward since 2003, and loves living in a diverse, urban, walkable neighborhood. Carol is an administrator and faculty member at the University of Minnesota. Carol moved to Seward in 1976, and was one of the first buyers of restored homes in the Milwaukee Avenue historic district. Carol has served on the Seward Redesign board since 1998 and was board President from 2012-2016. She also serves on the Board of Directors for MplsAchieve, a non-profit organization that supports the Minneapolis Public Schools. Garry and his wife, Nancy, have lived in Seward since 1980, benefitting from the early work of Redesign and serving on the Board as a Trinity Lutheran Congregation representative during the 1980s and early 1990s as well as the Cedar Riverside PAC and KMOJ Board in the late 1970s. He is currently the Martin Olav Sabo Emeritus Professor of Citizenship and Learning at Augsburg College where he chaired the Metro-Urban Studies Program from 1977-2010. He teaches Urban Planning and Urban Sociology at Augsburg and was a visiting professor at the Humphrey Institute/School from 2008-2010, teaching the Community-Based Research course initiated by CHANCE. Andy is Principal Project Manager with the City of St Paul’s Department of Planning and Economic Development, working with business development and property sales. He has a long history with the Franklin Avenue corridor, having worked for both the Native American Community Development Institute (NACDI) and Redesign on the Franklin LRT Station area development and other community projects. Andy has a background in architecture, real estate, construction management and community development. Tadd is a Vice President and Credit Manager/Team Lead at Wells Fargo in the SBA Lending Division. He joined Wells Fargo in 1990 and received his degree in Finance from the University of St. Thomas (1993). Tadd also secured his MBA in Finance and Strategic Management from the Carlson School at the University of Minnesota in 1996. Tadd’s work at Wells Fargo focuses on small business loans, including underwriting financing and interpreting financial statements for a wide variety of industry types, as well as managing construction loans. Tadd has previously volunteered with Nokomis Healthy Seniors, MN Red Ribbon Ride, Open Arms of MN, Habitat for Humanity and Feed My Starving Children. Tadd moved to Seward in 1998 and joined the Redesign Development Committee in June of 2012. Eddie is a Vice President and Real Estate Broker at Land Bank Twin Cities, where he manages strategic acquisitions and acquisition loan programs. He identifies and purchases commercial real estate to create economic and community development opportunities for non-profit and private developers. Eddie’s career is full of development and project management experiences as a Civil Engineer. Eddie is also a small business owner and Principal at Assembly MN, a commercial real estate firm. He was Senior Project Manager at Redesign from 2008 to 2014. Sheldon’s career has been eclectic. Sheldon recently retired from providing consulting services to nonprofit organizations and foundations on project management, program design, and technology. Sheldon was a founder of a community bike center with the aim of getting a more diverse group of people biking. His eclectic background also includes working on energy and environmental policy in Minnesota government and engineering design in the building industry. Sheldon has served as Chair of the Seward Neighborhood Group, the Twin Cities Media Alliance and the Minneapolis Telecommunications Network. He has also served on the Minneapolis Planning Commission, Minneapolis Board of Estimate and Taxation, the Minneapolis Library Board, and the Alliance for Nonprofit Management. Sheldon is currently Secretary/Treasurer of the Seward Towers Corporation. He and his wife, Bev, have lived in their 101-year-old home in Seward for over 35 years and recently completed their first 5-year remodeling plan (25 years after starting it). Ewart is a co-owner of Mill City Builders, LLP, a design/build residential remodeling firm that has been in business since 1994. Mill City Builders specializes in renovations and additions to older homes in Minneapolis and St. Paul. The company combines an appreciation for the existing home with thoughtful design, solid workmanship, great attention to detail and quality materials. Ewart was originally from Germany, has been a resident in the US since 1988 and has lived in Seward since 1996. Ewart’s interest in Redesign stems from his wider interest in development issues, an interest in design and construction and a desire to impact the community in positive ways. Abdul is a Program Manager at Minnesota Department of Employment and Economic Development (DEED), administering business finance programs. He has extensive experience in grant and fiscal management as well as budget development and financial reporting for businesses. Abdul is fluent in Somali and Kiswahili and understands the complications of Sharia-compliant lending. He is interested in Redesign’s business development activities particularly in connection with the East African population in Redesign’s service area. Tony currently serves on several charter school boards and is a vocational consultant to another. He is the retired superintendent for the Minnesota Transitions Charter School and its founder, and formerly served as Alternative Program Coordinator for the West St. Paul School District. Tony has previously served on the boards for the Longfellow Community Council, Federal Home Loan Bank and National Cooperative Bank, among others, and was a Minneapolis City Councilmember and a founder of Seward Redesign. D’Angelos is a seasoned commercial real estate professional with experience in real estate development and acquisition. He is currently a Vice President at THOR Construction Inc., guiding the creation of a new division responsible for development, investment and brokerage of commercial real estate. D’Angelos was a Redesign employee from 2014 through 2016 and is closely familiar with its operations and projects. Since D’Angelos left Redesign his heart and passion have remained in small business investment and the development of healthy communities. Susanne is the founder and former owner of Coastal Seafoods. She started the business in 1981, moving to Seward in 1985. Coastal Seafoods has two successful retail stores and a wholesale business, supplying the Twin Cities and surrounding area restaurants with the best fresh and frozen fish and seafood. In 2015, Suzanne was named one of the Top Women in Business by the Minneapolis/St Paul Business Journal. Suzanne also has a background in banking, prior to starting her own business, and serves on the Seward Civic and Commerce Association’s board.